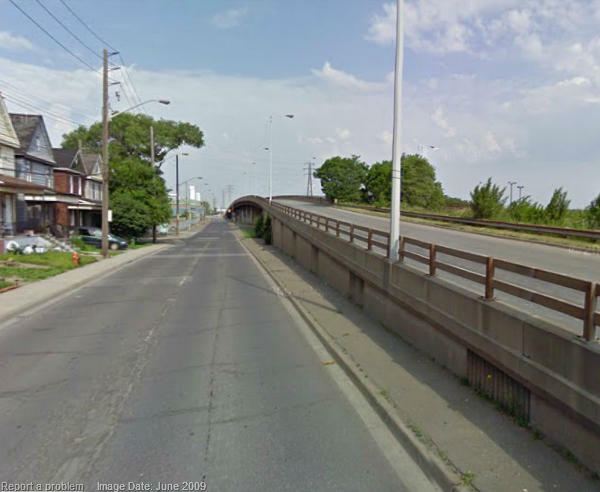 Too much of the debate over Hamilton's streets is driven by familiarity with the status quo, fear of change and a tendency to rationalize existing beliefs instead of reasoning from evidence. One of the more bizarre arguments against converting Hamilton's network of one-way streets to two-way is the claim that a two-way street network would somehow be less fault tolerant - that a disruption in traffic flow due, say, to a collision or lane closure would cause bigger problems on a two-way network than on a one-way network. The reasoning seems to be that if, say, a one-way street with four lanes westbound is converted to two-way, that means there will only be two westbound lanes and any lane closure will lead to "gridlock". There's a glaring problem with this reasoning: it completely neglects to take into account that in a two-way conversion of paired one-way streets, the parallel street will also be converted back to two way, providing an alternate route. When a one-way network is converted to two-way, by definition the number of routes in a given direction doubles. That can only result in a more resilient network, since drivers have more ways of getting to a destination. We don't even have to imagine how this might work. We only need to look at the recent closure of Cannon Street at James when a water main burst on September 13. Cannon was closed completely for a while and then just one lane was open. Traffic moved slowly through the single lane, as it would if only a single lane was open on a two-way street. However, it did not lead to "gridlock", even when the street was completely closed. Thanks to the 2010 conversion of York/Wilson Street to two-way, drivers on Cannon were able to go a block south, turn right onto Wilson and proceed west. Traffic flowed smoothly westbound on Wilson/York and provided the flexibility to allow cars to detour around the closure on Cannon. Had Wilson remained one-way, drivers would have had to continue south another couple of blocks to King Street before they could turn westbound. 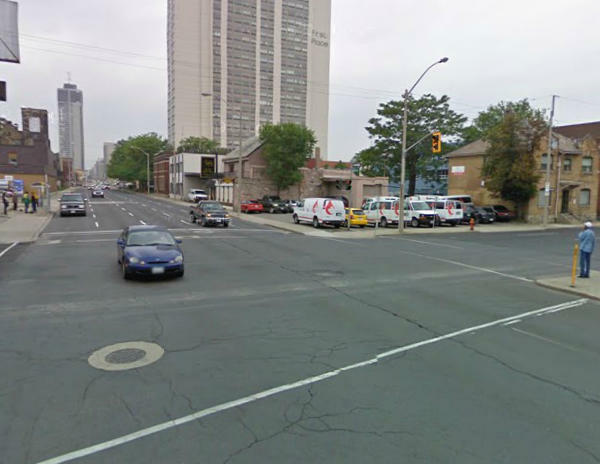 In the past, I have criticized the two-way conversion of York for being Two-Way-In-Name-Only (TWINO), since three lanes remain dedicated to eastbound traffic and only one lane runs westbound, and it is illegal to turn westbound onto York from James Street in either direction. 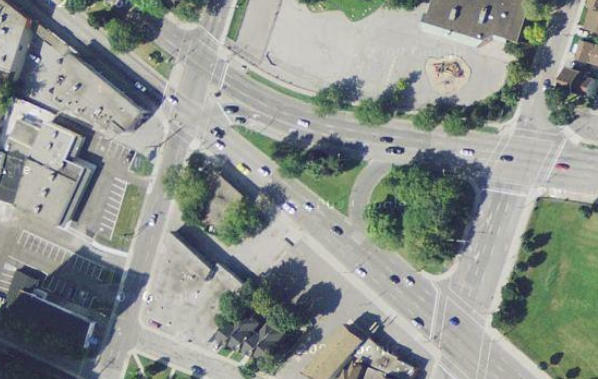 However, even in its attenuated form, this two-way street was able to serve the function of allowing traffic to route around a blocked intersection. This is one of the streets that we are expected to believe will become "gridlocked" if we convert our network to two-way. But lest you claim that I'm cherry-picking a minor street instead of a major arterial, here is a video of Main Street at Caroline, where a lane is closed to traffic next to the old Revenue Canada building. This video was shot around lunchtime on a recent weekday. 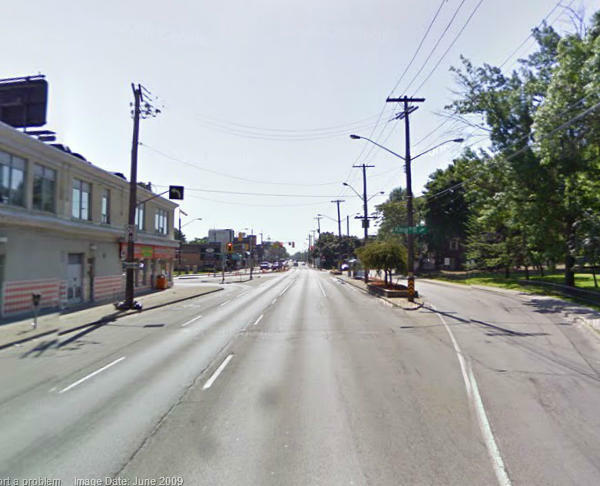 Too much of the debate over Hamilton's streets is driven by familiarity with the status quo, fear of change and a tendency to rationalize existing beliefs instead of reasoning from evidence. We need to do better. One of the more bizarre arguments against converting Hamilton's network of one-way streets to two-way is the claim that a ... collision or lane closure would cause bigger problems on a two-way network than on a one-way network. Where was this argument made? If one way proponents are making this argument, it certainly isn't a strong one. I can't remember seeing that argument being made around this blog. Can anyone point me to where someone tried to argue the above? What I have seen people suggest is that reducing the total number of lanes in the city could, likely, cause traffic disruption. amazing how empty all of our streets are. We have the road network for a city of a few million people. All the highway style ramps everywhere are ridiculous. 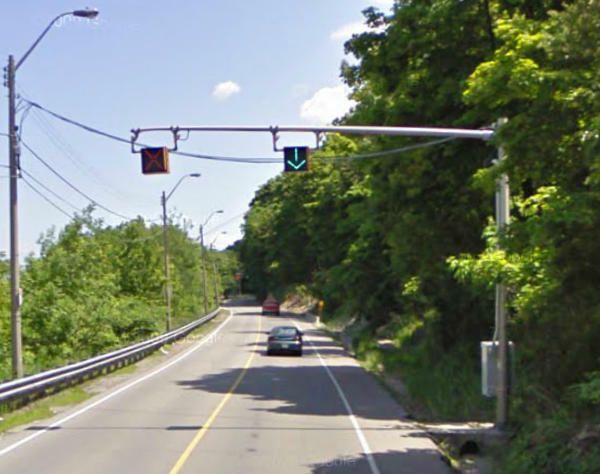 The Claremont Access might be one of the biggest offenders. 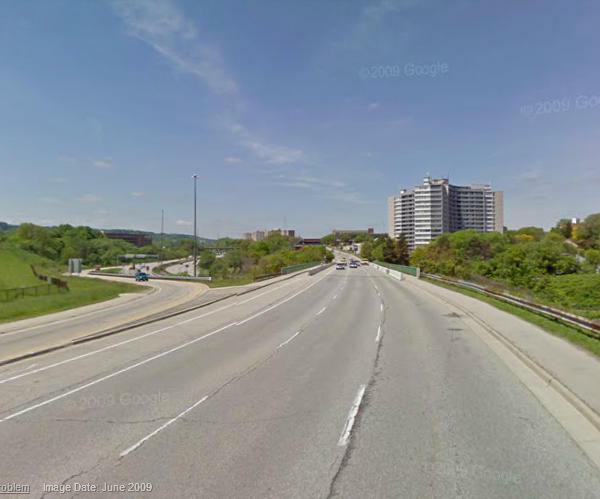 A huge, elevated freeway of 5 lanes that carries enough traffic to be 3 lanes (1 down, 2 up). One downbound lane has been closed for ages and it still roars at 90km. 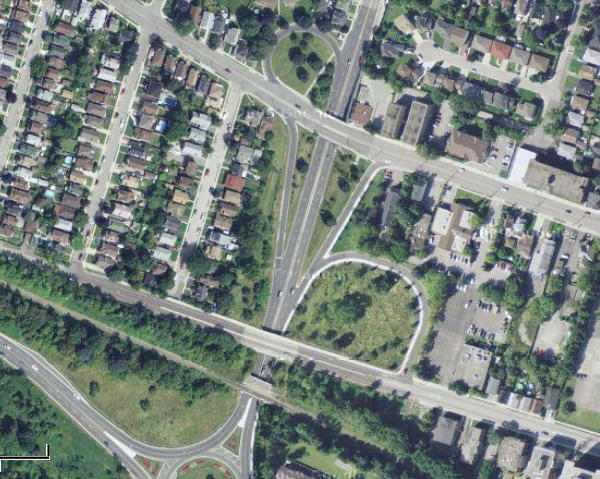 This would be great for bike lanes and LRT up/down the escarpment. Also, the whole system that involves downbound only in the morning and upbound only on Sherman Cut with the signals, barriers etc.... really?? As you say, the 40,000+ steel workers are gone. 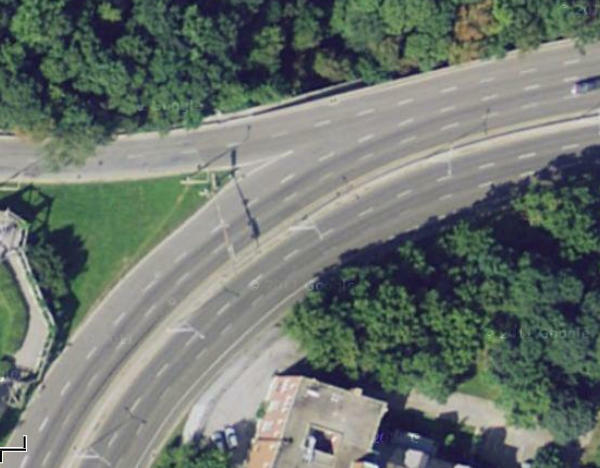 Just take down all the expensive signal stuff and let the Sherman Cut stay 1-lane each way 24-7. 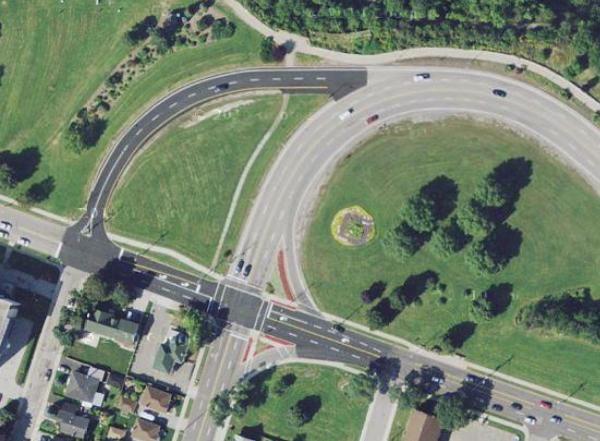 Replace the intersections with ROUNDABOUTS. The rest of the world uses them. Just us backward North Americans who don't. Think they're dangerous? Then you can't drive properly.